Retirement Villa JUST SOLD in Outdoor Resorts!! 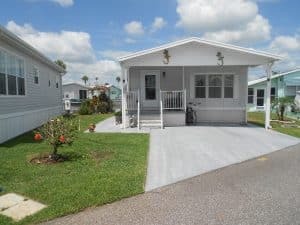 FULLY FURNISHED 1+ beds – 1.5 baths backing up to the common area. New roof 2004. Great getaway home with lots of storage and sleeping space for family. The park itself has 980 lots, is about 3 miles to the entrance to Disney and located conveniently to about 40 restaurants to the East and countryside to the West. ORO is gated and the fees are $490/qtr which pays for your water, sewer, basic cable, trash, and lawn mowing. It is well maintained and just about the least expensive living in this area that you’ll find. ORO is a 55+ , one pet community. Come take a look! !